From superstars to survivors, the 2018 Winter Games features an intriguing selection of repeat Olympians. Some are up in years, while others remain baby-faced. Some players require no introduction. Russian superstars Pavel Datsyuk and Ilya Kovalchuk are both back for their fifth consecutive Winter Games. Both made their Olympic and NHL debuts in 2001/02, contributing to Russia’s last Olympic medal in Salt Lake (bronze). In between, they amassed Stanley Cups, Gagarin Cups, IIHF World Championships, and individual trophies. Conversely, some may be surprised to realize Christian Ehrhoff is playing his fourth Olympics in PyeongChang. Like Datsyuk and Kovalchuk, the workhorse defenceman debuted in 2002, and if Germany had qualified for Sochi, this would probably be his fifth go-round. Yes, Ehrhoff is past his glory days of quarterbacking the Vancouver Canucks’ power play to the 2011 Stanley Cup final and signing a $40-million deal with the Buffalo Sabres. Still, the 35-year-old Kolner Haie captain will log big minutes under his former San Jose teammate, national coach Marco Sturm. Czech captain Martin Erat also flies under the radar as a four-time Olympian at age 36. A 2006 bronze winner in Turin, this puck-moving winger with 881 career NHL games is helping to mould the new generation of Czech stars with Brno Kometa, as Martin Necas is his club teammate. U.S. captain Brian Gionta wouldn’t likely be playing this season if not for PyeongChang. The 39-year-old veteran of two World Juniors and two Worlds made his lone previous Olympic appearance in 2006. How about the women? It’s hard to believe Canadian captain Marie-Philip Poulin, 26, is heading into her third straight Games after scoring the gold-medal winner in both 2010 and 2014. Sweden’s Pernilla Winberg, 28, has an even longer history. Entering her fourth Olympics, she won an historic silver medal in 2006 and led the Olympics in scoring in 2014. Japanese forward Hanae Kubo, who led Olympic Qualification Group D with six points last year, gets into her second Olympics at age 35. Even more remarkably, Finland’s ageless play-maker Riikka Valila is bound for her fourth Winter Games at age 44. The Jyvaskyla native, who retired from hockey from 2003 to 2013, topped the inaugural Olympic women’s tournament in 1998 with 12 points. From recent bronze medallist Switzerland goalie Florence Schelling, who was named MVP in Sochi 2014, and defender Nicole Bullo will play their fourth Olympics as well. In 2014, Teemu Selanne was named Olympic MVP at age 43. So don’t be surprised to see some of these wily veterans make a big impact. Susanna Tapani is a busy and accomplished athlete. Not only does she excel at ice hockey but also inline hockey and ringette and in each case, Tapani has represented her country and brought home honours after doing so. 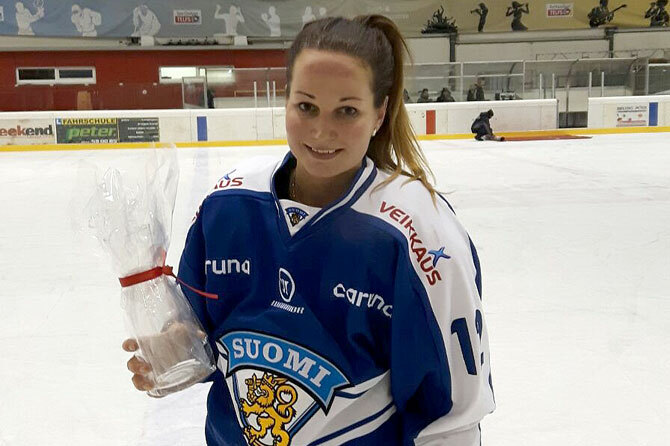 At the Four Nations tournament in November, which was the biggest test for the top women’s ice hockey team before the Olympics, Tapani was an active presence throughout the tournament for Finland, scoring a goal and assist in four games. In 2017, the 24-year-old Tapani has established herself as a key contributor for the national team. Tapani was instrumental in helping Finland win bronze at the 2017 IIHF Ice Hockey Women’s World Championship. She led the team in scoring with three goals and nine points, which tied her for third in tournament scoring. Tapani was never better than helping Finland to a 4-3 win over Canada in the tournament on 1st April. It was the first time in IIHF competition that Finland’s women defeated Canada, going back to 1990. She scored Finland’s third goal of the game and added two assists. Since joining the national team in 2011, Tapani has won three bronze medals and believes Finland is getting closer to taking the next logical step in international competition. Securing a spot in a gold medal game at the World Championships and Olympics drives Tapani and her team. In Korea she will enjoy her second Olympic experience. The Winter Olympics offer yet another opportunity to build on what she’s accomplished so far and build on her emergence as a key player. Tapani’s experience at the Four Nations Cup has been a good one. Finland’s overtime win against Sweden assured a third-place finish and some momentum for the national team heading into 2018. Still, there is work to be done. If anything, the Four Nations Cup offers Tapani and her team some insight as to what can be worked on. Tapani keeps an active schedule. After the Four Nations Cup had wrapped up, she was back in North America for the World Ringette Championships and then Korean for the Olympics and, finally, the inline hockey next summer. She’s twice been part of a World Championship winning ringette team and an inline medallist.